My friend Tiffany and I spent one summer in Seattle eating this chili approximately every day. That might be an exaggeration, but we really did eat it a lot. And we were excited every time. And it was delicious. One of the reason's I like this recipe is because it's quick, easy, and filling. Also, most of these ingredients regularly live in my cupboards or fridge so it's easy to throw together last minute. 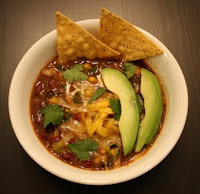 We had taken to calling this "taco soup", but it is not exactly taco or soup so much as it is chili... so no squabbling. I've come to realize that for most of my recipes I don't measure since I do everything to taste. 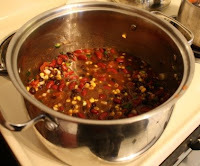 In a large pot over low heat combine the drained kidney beans and corn, and the cans of black beans and stewed tomatoes. Throw in some chopped onion, chopped jalapeno (I use a lot, with seeds, because I like it hot), chopped green onion, some cilantro, and add the taco seasoning mix, stirring together. Put on the lid and allow to warm over medium heat, stirring occasionally. Serve in warmed bowls, garnished with chopped cilantro, green onion, cheddar, and tortilla chips. Enjoy!